Toutatis and Gironde created dozens of add-ons with new space vehicles. The guides for the SPACE EXPLORATION series have lost relevance. It requires fast update of the guides of the SPACE EXPLORATION series. The update can be made by the user himself, without reinstalling the entire graphical interface or Celestia itself. The green arrow indicates the [>] button, which visualizes the mini-buttons that include themed guides. Click it (step 1). On the mini-buttons are inscriptions of 1-4 characters, indicating the theme of the guidebooks. For an inexperienced user these symbols may not be clear. Press the [Guide] button (step 2), an information panel will appear with the decryption of the symbols on the mini-buttons. The ROAD TO SPACE guide is activated by a mini-button [ Te1]. To the left of this mini-button appears the red indicator "o". Note: Space vehicles marked with a yellow font are missing. In the attachment file SpaceRaceBox.zip as of 05-07-2018 22-09-2018 19-10-2018 25-10-2018 . The Mounting of ISS guide is activated by a mini-button [ ISS ]. To the left of this mini-button appears the red indicator "o". In the attachment file SpaceRace3Box.zip as of 05/07/2018 25-09-2018 19-10-2018. The URSS.MOON guide is activated by a mini-button [ Lu1 ]. To the left of this mini-button appears the red indicator "o". In the attachment file LunaBox.zip as of 07/06/2018 26-09-2018 19-10-2018. The UR-NASA.MOON guide is activated by a mini-button [ Lu2 ]. To the left of this mini-button appears the red indicator "o". In the attachment file Luna2Box.zip as of 08/06/2018 27-09-2018 19-10-2018 . The Venus Exploration guide is activated by a mini-button [ Ve ]. To the left of this mini-button appears the red indicator "o". In the attachment file VenusBox.zip as of 03/11/2017 27-09-2018 19-10-2018 . The Mars Exploration guide is activated by a mini-button [ Ma ]. To the left of this mini-button appears the red indicator "o". In the attachment file MarsBox.zip as of 14/06/2018 27-09-2018 19-10-2018. Tutatis and the Gironde have developed many new spacecraft. I increased the number of guidebooks from 10 to 16. Study of Earth-1 guide is activated by a mini-button [ Te2 ]. To the left of this mini-button appears the red indicator "o". In the attachment file Te2Box.zip as of 12/08/2018 22-09-2018 19-10-2018. Study of Earth-2 guide is activated by a mini-button [ Te3 ]. To the left of this mini-button appears the red indicator "o". Rockets-carriers-1 guide is activated by a mini-button [ Ro1 ]. To the left of this mini-button appears the red indicator "o". In the attachment file RocBox.zip as of 27/06/2018 23-09-2018 19-10-2018. Rockets-carriers-2 guide is activated by a mini-button [ Ro2 ]. To the left of this mini-button appears the red indicator "o". In the attachment file RocBox.zip as of 26/06/2018 24-09-2018 19-10-2018. Study of Planets-1 guide is activated by a mini-button [ So1 ]. To the left of this mini-button appears the red indicator "o". In the attachment file So1Box.zip as of 02/08/2018 27-09-2018 19-10-2018. Other similar versions of the Cassini Huigens mission should be removed. The guidebook uses the acceleration mode of time. To neutralize the side effect - accelerate the rotation of the model around its own axis - it is recommended to install (in the extras folder) the file ModifySpaceCrafts.ssc. Study of Planets-2 guide is activated by a mini-button [ So2 ]. To the left of this mini-button appears the red indicator "o". In the attachment file So2Box.zip as of 29/07/2018 27-09-2018 19-10-2018. The guidebook uses the acceleration mode of time. To neutralize the side effect - accelerate the rotation of the model around its own axis - it is recommended to install (in the extras folder) the file ModifySpaceCraftsSo2.ssc. 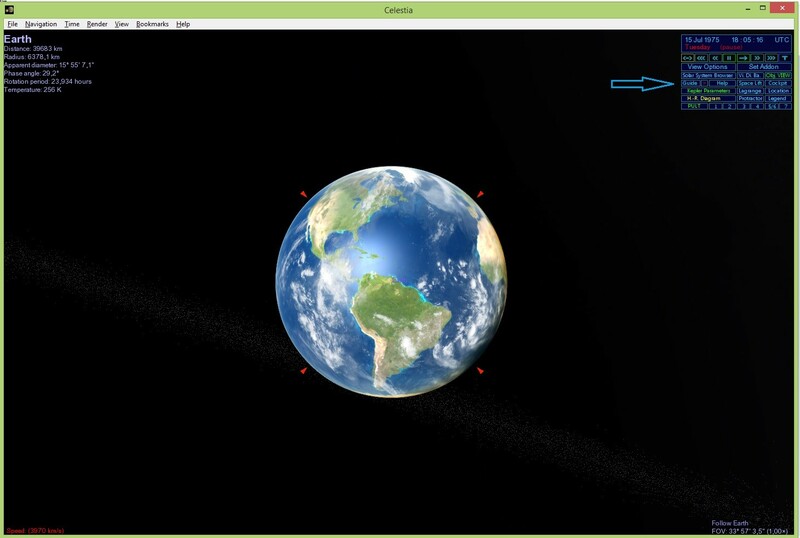 Study-1 of Comets & Asteroids guide is activated by a mini-button [ So3 ]. To the left of this mini-button appears the red indicator "o". In the attachment file Sol3Box.zip as of 11/08/2018 27-09-2018 19-10-2018. For the visibility of comets and asteroids to include ViDiVa, put a checkmark for [Comets All !!! ], [Asteroids 31]. The guidebook uses the acceleration mode of time. To neutralize the side effect - accelerate the rotation of the model around its own axis - it is recommended to install (in the extras folder) the file ModifySpaceCraftsSol3.ssc. Study-2 of Comets & Asteroids guide is activated by a mini-button [ So4 ]. To the left of this mini-button appears the red indicator "o". In the attachment file Sol4Box.zip as of 11/08/2018 27-09-2018 19-10-2018 . Space telescopes is activated by a mini-button [ Tele ]. To the left of this mini-button appears the red indicator "o". In the attachment file TelescopeBox.zip as of 16/08/2018 27-09-2018 19-10-2018. In the attachment file Telescope2Box.zip as of 28-09-2018 29-09-2018 19-10-2018.Space telescopes is activated by a mini-button [ Tel2 ]. To the left of this mini-button appears the red indicator "o". Note: The section "Not systematized:" is intended for temporary accommodation of space vehicles from other Guides. The coordinates of all the guidebooks have been changed. See this link for details. On September 28, 2013, a modification of the Guides of the Spacecraft series was completed. The existing links are highlighted in blue font.